This timeline depicts PepsiCo's net revenue worldwide from 2007 to 2018. In 2018, PepsiCo's net revenue worldwide amounted to about 64.66 billion U.S. dollars. PepsiCo is an American food and beverage corporation, based in Purchase, NY. Famous company beverage brands include Pepsi and Mountain Dew. 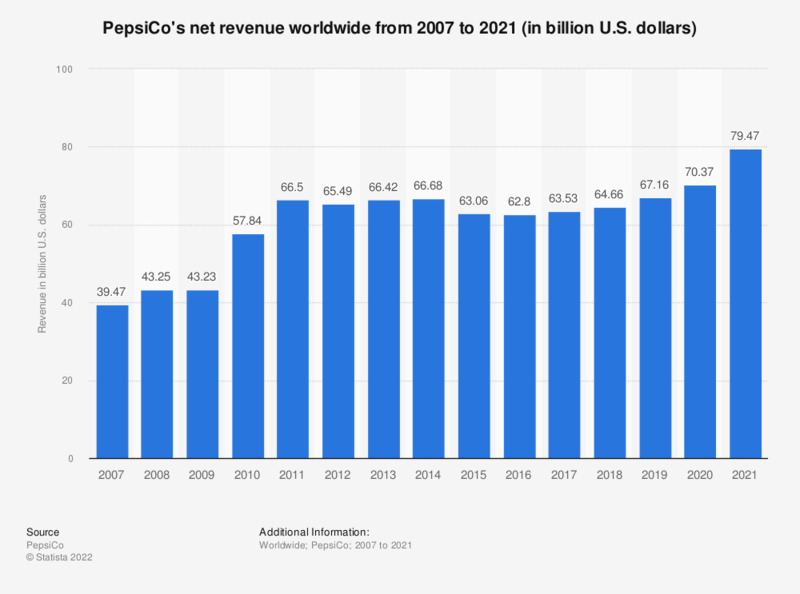 PepsiCo has increased its global net revenues from 39.47 billion U.S. dollars in 2007 to 64.66 billion U.S. dollars in 2018. Caleb Bradham developed the recipe for the Pepsi soft drink in 1880 in North Carolina. As his drink became more popular, he established the Pepsi-Cola Company in 1902. In 1965, the Pepsi-Cola company merged with Frito-Lay Inc., to form PepsiCo, Inc.. Currently, the company owns a variety of well known brands that with about 60 percent dedicated to food products and about 40 percent to drink products. PepsiCo is divided into four main divisions including Americas Foods, Americas Beverages, Europe, Asia and Middle East and Africa. As of 2014, over half of the company’s revenues were generated from the PepsiCo Americas Foods and Americas Beverages, totaling 38 percent and 32 percent of global net revenues, respectively. Many are familiar with the competition between PepsiCo and Coca-Cola, named the “cola wars”, but lately, both companies have started to depend on businesses outside of the beverage market. Recently, the industry is responding to changes in the market as the demand for carbonated soft drinks has decreased. However, studies have indicated that few people can discern the difference between the two soft drinks in a blind taste test, nevertheless, there have been indications that Coca-Cola has been more successful in its branding. Data prior to 2016 were taken form previous editions of the publication.